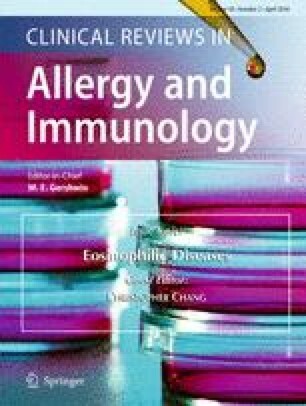 Eosinophilic gastrointestinal disorders, including eosinophilic esophagitis, gastroenteritis, and colitis, refer to a spectrum of clinical diseases that present with variable degrees of infiltration of the gastrointestinal tract by eosinophils in the absence of other known causes of tissue eosinophilia. Clinical symptoms and laboratory findings are usually non-specific and may or may not be accompanied by peripheral blood eosinophilia. The extent of eosinophilic infiltration of the gastrointestinal wall varies from mucosal to transmural and serosal involvement. Diagnosis requires presence of gastrointestinal symptoms, demonstration of gastrointestinal eosinophilia by biopsy, and exclusion of other known causes of tissue eosinophilia. Many studies have pointed toward the eosinophil as the major offender; however, the exact functional role of the eosinophil in the pathogenesis of eosinophilic gastrointestinal disorders remains unclear. The roles of T-helper-2 cytokines and other mediators, such as eotaxin-1 and interleukin-5, have gained significant importance in the pathobiology of eosinophilic gastrointestinal disorders. Current understanding of treatment is based on case reports and a few case series, as there is a lack of large prospective studies. Steroids are currently the mainstay of therapy, but the roles of other drugs such as leukotriene inhibitors, mast cell stabilizers, interleukin-5 inhibitors, and anti-immunoglobulin E, along with other targets in the immune pathway, are currently being explored. The authors would like to acknowledge Katryn Furuya (MD, FRCPC) and Matthew Di Guglielmo (MD, PhD) who assisted in editing this paper. Authors V. Uppal, P. Kreiger, and E Kutsch declare that they have no conflicts of interest.